Please Read - This hands-on workshop is not intended for everyone. It is not a discussion group or open forum. Class fee is $30 at the door. In this initial class we will explore and categorize our known and suspected gifts. In this manner we will lay a foundation for growth and development of our psychic selves. Knowing ourselves and understanding our abilities is the first step toward wielding our gifts with control and accuracy. In subsequent classes we will verify and hone our talents with activities and discussion. These are hands-on workshops and participation is expected. The goal of our series will be to develop expertise in areas of particular interest such as mediumship, channeling, divination, healing and, etc.. Our ultimate directions will be determined by class members as we evolve. 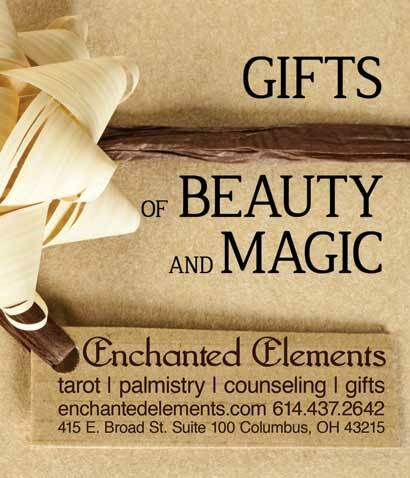 RSVP with Advance pay of $25 (discounted) online or by contacting Enchanted Elements (614) 437-2642.